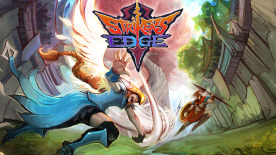 Strikers Edge is a medieval dodgeball with weapons, ancient warriors and special powers. Challenge your opponents in online and local multiplayer, ascend to the top of the ladder and become the best striker! DODGEBRAWL: Strikers Edge is a game of dodgebrawl! Use whatever means it takes to bring your foe down from your side of the rift. PICK UP & MASTER: Each striker has its own set of abilities, weapon, stats and playstyles. Which one will you choose and master? Choose among 8 unique strikers, each with it's set of abilities, play style and strategies. Play 1vs1 and 2vs2 matches, obliterate the opposition in online and local sessions. Select between 4 different arenas with distinct layouts, obstacles and hazards to add to your strategy. Easy to learn, hard to master: pick your favorite striker and get ready to discover all his hidden mechanics, combos and nuances. Strikers Edge puts mind games front and center. Predict your opponents moves and surprise them with yours! Twitch Integration: Streamers will be able to interact with their audience when playing: viewers can become a member of the crowd inside the game, throw cheer or boo at the players, vote for match modifiers and more!